There are very few financial hurdles in the video industry. Not long ago my brother sent me a link to a video. He had shot most of it on his iPhone and his son had edited the video on an Apple iPad using iMovie. These days everyone has access to the tools and technology that we, as video professionals, use every day. Video production tools are now commodities, affordable to almost anybody. In the Betacam SP days the cost of gear acted as a gatekeeper. To enter the field one had to intern or apprentice. Today all it takes to be a video "professional" is a camera, a computer and business card. Consequently the market is flooded with inexperienced and incompetent people, willing to work for peanuts. In some cases, video prospects can't tell the difference, and consequently hire the least expensive. I wonder if professional still photographers wrestled with this problem back when cameras became a part of everyday life. If so, things have seemed to have settled down now. No one would ever suggest bringing in their little nephew to take a photo of the CEO for the annual report. It is the responsibility of the skilled video professional to educate prospects. As is true with most products and services, you get what you pay for. Video production prospects need to know why hiring the right professional, even though the initial cost may be higher, will save them money in the long run. A properly produced video is more likely to clearly communicate their message and will better engage their audience. Isn't that the whole point of video communication? There's an artistry to film and video production. Although the tools are readily available, it requires a true craftsperson who knows how to tell a story, not just someone who knows how to operate the tools. A true professional can offer the technical expertise as well as the creative vision to communicate the appropriate message. One might also consider the various crowd sourcing services such as Thumbtack and Smartshoot in this discussion. I compare it to being outsourced by the kid next door. Absolutely, but I think after getting burned once or twice by the kid next door, prospects will hopefully look past the bargain basement prices and choose services based on overall value. These issues affect graphic designers as well. Unfortunately, for the same reasons, there is an expectation that professional designers will work for low fees. Hear, hear. These attitudes plague the graphic design industry as well. As you stated above you do have to work harder to educate your clients about the advantages to hiring a skilled professional versus going the (hopefully) less expensive route of hiring a non-professional. Would you hire an intern to do open heart surgery ? Would you hire a person with no experience to build your house? The same goes for producing videos and films. Why do you think Hollywood is so closed to outsiders? There is a very good reason for that. The professional still photography business has caused seasoned professionals to go into other types of professions because everyone who had a cell phone has a cell phone camera with them at all times. The video profession can't be far behind. I think that this has been going on in many professional venues for decades, especially in the video world. As technology climbed the ranks of salesmanship, everything has changed in video. From having to have thousands of square feet of studio, edit, duplication space, to the smaller indie which has acquired the same capability, in theory, as the large studio operations on their desktop. That of course means, what is a client is willing to spend for something. Think back to the early outdoor programs that really permeated the market in the 80's/90's. With camcorders of decent quality, all you needed was an investment in BetaCam tape, and batteries. Those who went deep in the outdoor hunting world simply followed the simple rule of, "something on any tape is better than having nothing on tape" for their wild game/hunting program. Today, if you're still shooting in SD, or even HD, and not on the cusp of 4k, you're seen by many as not being a serious player in production. Especially by a client who simply hears a techno blurb and thinks he/she has to have it for their corporate piece. You'll probably not break into that company, today. The "equipment war" has been going on for all of my years in the biz, and it doesn't seem to be letting up. There is so much more to a finished piece than all the stacked up latest and greatest equipment sitting in the corner. From my experience, good clients know this, and remain loyal to those that deliver the good goods. I-phones and I-cam's be damned. If we as producers make the best possible story for the moment, we'll keep working. With whatever gear we have. I think the "Would you hire an intern to do open heart surgery?" statement sums it up. It's FAR more about the operator than the tools, and what value they bring to the process of creating a video. Most clients don't know the process of creating their videos. After 30 years of creating marketing campaigns and following the trends we give far more than great shots, but complete solutions to our clients. Best of luck to all those helping their customers! 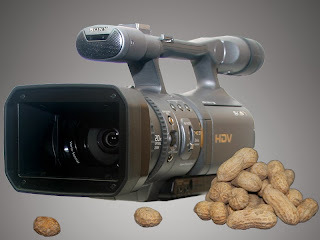 I still think the requirement of a physical (local) presence to create the video product is going to be key to the survival of vidographers and photographers. Any career where data can just be shared via email, cloud, internet to create the product means that it will be in global competition so India, EU, Tailand, etc, will all be players in the market and drive price down.